Grease L is a petroleum hydrocarbon grease, containing no additives. 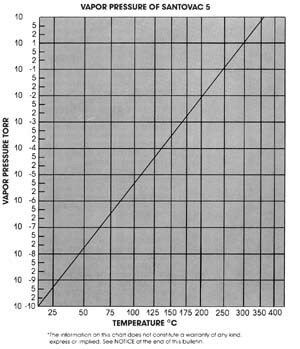 Very low vapor pressure (@20°C of 8x10-11 torr), high vacuum grade. Type L is widely used in the stationary phase of gas liquid chromatography, and may be used on all ground joints in a vacuum system (not for stopcocks). Its solubility is as follows: in Ethanol at 20°C-0.003%; 60°C-0.005%; 100°C-0.011%; 150°C-0.011%. Grease L softens and melts at about 47°C and it is not recommended for joints where temperatures exceed more than 30°C in use. Grease T is recommended for these higher temperatures. Similar to grease type L, but it contains more wax. Grease M has an estimated vapor pressure @ 20°C of 2x10-9 torr, higher than Type L. Type M is recommended for applications where a grease of moderately low vapor pressure is required; such as for sealing ground joints on the backing side of oil diffusion pumps. Similar to Type L and Type M, but Type N grease has a special additive which gives it a tenacious, rubbery consistency and provides an extra cushioning effect which absorbs vibrations in equipment, making N grease invaluable in fragile glass to glass joints, like burette taps, which continually risk fracture. Grease N is widely recognized and recommended as the cryogenic vacuum grease of choice. Type H grease is designed for high temperatures (-10 to +240°C) in a wide range of applications in both science and industry. With good "friction", grease H is ideal for use with laboratory glassware, but combined with properties of high thermal conductivity, it is the perfect choice for the electronics and space industries where heat sink media require adhesion. Grease H is a filled hydrocarbon which exhibits excellent thermal conductivity, and strong absorption properties. The capability to absorb greasy or chemical impurities on metal and glass surfaces is a value "tool" required by electronic industries. Type T is designed for lubricating glass taps and for general purposes. Has a melting point of 125°C and has an estimated vapor pressure @ 20°C of 5x10-9 torr. Although type T is useful at higher temperatures, it can also be used at ambient temperatures. Does not suffer from contamination problems associated with silicone based greases such as "creep" or "carry over"
The unique properties of Apiezon AP100 lubricating vacuum grease mean it is frequently used to protect stepping motors and gearboxes from corrosion and abrasion, particularly when they are subjected to high load conditions. AP100 is also used to prevent seizure in stopcocks, taps and small metal fastenings. The creep resistance of Apiezon AP100 benefits scientific and semiconductor users alike. AP100 helps to increase the accuracy of analytical techniques and improve yields in semiconductor manufacture by contamination avoidance. In addition, AP100 is used for surface coating applications where silicone contamination can lead to poor surface adhesion and incomplete coating defects. Type 101 is an excellent general purpose, hydrocarbon grease, which is intended for a variety of industrial and scientific applications. PFPE 501 is a chemically inert, high temperature and extreme pressure lubricant. With an upper operating temperature of 250°C and vapour pressure of 1.3 x 10-12 at 25°C, it is robust, versatile and can be used for sealing and lubricating under the most extreme operating conditions. This includes environments where aggressive chemicals and strong oxidising agents are regularly used. The Apiezon range of waxes features three products including the popular Apiezon Wax W, also known as 'Black Wax'. All three waxes in the Apiezon range can be used as permanent or semi-permanent vacuum sealants or mounting media. Apiezon Wax W is also a perfect etch resist. Why use Apiezon Q Compound? A silicone lubricant for glass-to-glass joints and glass-to-rubber connections. Resistant to most chemicals and is inert and heat stable. TorrLube® vacuum lubricants are manufactured to perform better than any other vacuum grease or oil available. TorrLube® Oil is an extremely pure PFPE (Perfluoropolyalkether) blend which is thoroughly distilled and then filtered through a submicron screen. TorrLube® Oil has the ability to withstand thermal expansion and contraction as well as chemical and mechanical stress, while still maintaining consistent viscosity. These properties make TorrLube® the ideal lubricant for bearings, automated slides, and screws that have a tendency to gall or cold weld while working under extreme conditions. TorrLube® Extreme Grease is white, odorless, nonflammable, and chemically inert products based on TorrLube® Oil and the most advanced PTFE thickener available. It does not contain Sodium or Iron. TorrLube® Extreme Grease remains stable and will not break down under mechanical stress and lose its ability to hold TorrLube® Oil. TorrLube® Extreme Grease helps prevent sticking, jumping, and mechanical noise, securing smooth, controlled movement. TorrLube in 1cc syringe – Each syringe contains 1 cc of TorrLube® lubricant with a #22 gauge blunt needle attached for close application. This size is ideal for use in small research units and for maintenance and service tool kits. Syringes are packaged in a clean room environment and the needles are sealed to prevent contaminant or leakage. A set of two small bottles, each containing 60cc of TorrLube® lubricant. Every bottle comes with a sealed cap. A luer lock cap and a #22 gauge blunt needle are provided for closed application. The bottle set is appropriate for larger manufacturing units and production fabs. Each twin pack of TorrLube® 60cc bottles is sealed to prevent leakage and contamination. Good for small or large vapor diffusion pumps. Good pumping speed and high backing pressure. If a cold trap is used, oil B can obtain a higher vacuum than oil C does. A water-white oil with a higher pumping speed than oil B, although all other characteristics are similiar to B. Because it has an extremely high purity it is suitable for use in the evacuation of mass spectrometers. Obtains the highest vacuum pressure (10-7 torr) of all of the oils without the need of a cold trap. A Polymethyl Ether, designed for an ultra high vacuum range: 10-10 torr. Ultra low vapor pressure results in low ultimate pressures; there is no need for a cold trap and it is suitable for diffusion pumps. Santovac 5 may discolor with use but it will maintain its physical properties.